Vibration microscope by Rudolph Koenig. 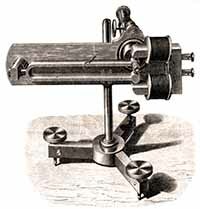 Vibration microscope from Koenig’s Acoustic Catalogue, 1865. Cost: 120 francs. Helmholtz (1821-1894) of the earlier optical comparator by Jules Antoine Lissajous (1822-1880). The device allows one to determine the frequency of a tuning fork or other vibrating object with respect to a fork of known frequency, by way of Lissajous figure analysis. The standard fork has a small glass lens attached to one of its prongs. If the standard fork is sounded, objects visible through the lens will appear to vibrate. A second tuning fork can then be positioned behind the hole, so that its plane of vibration is at right angles with that of the standard. When both forks are driven, a point on the second fork’s prong, viewed through the lens, will appear to trace out a curve. If the tuning fork frequencies are a fraction multiple of one another, simple Lissajous figures will appear (see left diagram below). However, if the frequencies are slightly mismatched, the curve will not remain constant, but change in a repeating way. Even if the frequencies are not identical, the difference between them can be deduced from the rate at which the pattern changes. 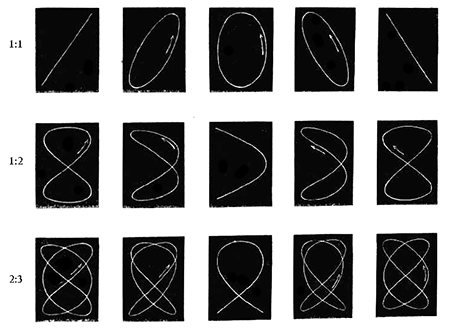 Simple Lissajous figures for various frequency ratios, in different stages of their cycles. From Koenig’s Acoustic Catalogue, 1865.